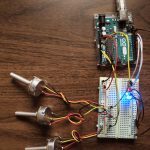 I used Arduino with three LEDs (red, blue and green) and 3 potentiometers. 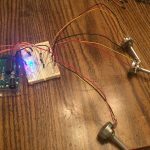 I edited the sketch code to control the red LED’s blinking speed and the brightness of green and blue LED with three different potentiometers . The result, as shown in the image below, is quite as expected. The blinking speed of the red LED and the brightness of the green and blue LED is controlled by the plot sucessfully. In this lab the brightness of 3 LED lights are each capable of being independently controlled by its own coinciding potentiometer. 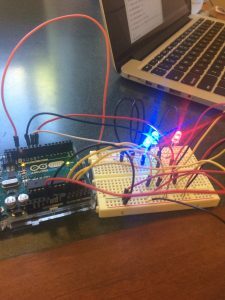 For this assignment, I used an Arduino Uno to control the brightness of three different colored LEDs using three separate potentiometers. 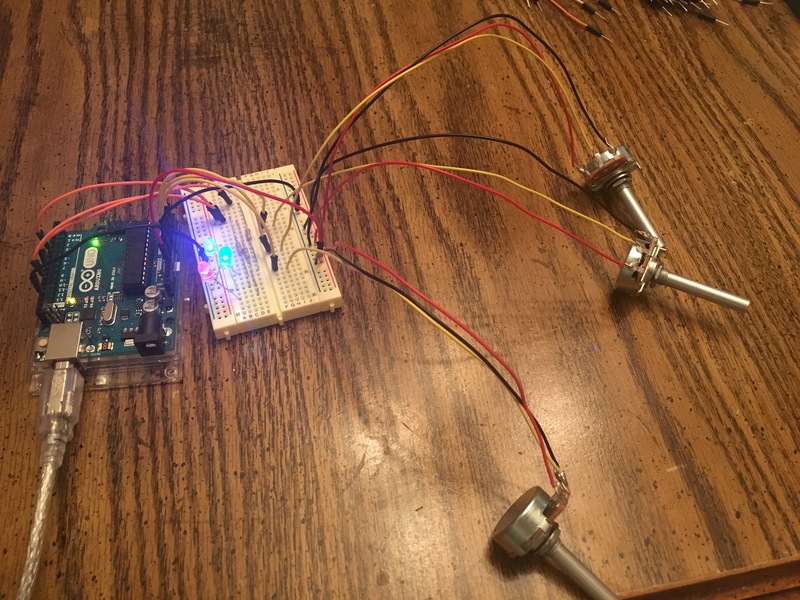 I used one potentiometer to control the turning on and off of the three LEDs in sequential order. 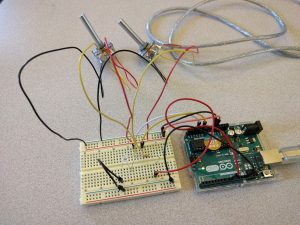 This circuit uses two potentiometers, one to control the brightness of the LED and the other to control the blinking rate. Within each blink, the brightness is held constant. 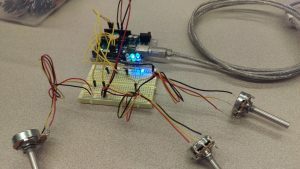 All measurements are done using analog inputs on the Arduino. 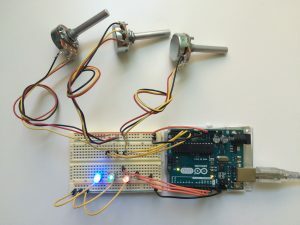 I used an Arduino-Uno as a microprocessor to control the brightness of three LED lights, realized through three different rates, which are translated from data fed in from three different potentiometers. This program fades three LEDs to a brightness determined by one potentiometer with a pause between fades determined by another potentiometer. The overall effect is intended to mimic pules/heartbeats, where the brightness could be analogous to beat strength and the pause time analogous to beat rate. 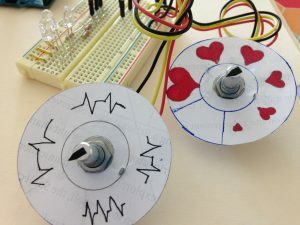 I interpreted the “mapping between the rotational position pot and LED output” to mean a map between the potentiometers’ visual configurations and the output (perhaps a misinterpretation – I’ll find out! ), so I made two gauges to fit over the pots. 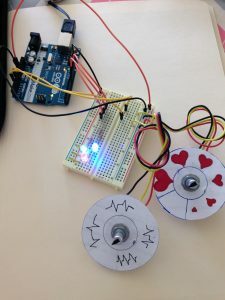 On one gauge, the size of the heart corresponds to beat strength (the max brightness in the pulse) while on the other gauge, the rate diagrams of variable spaces are intended to convey the idea of slower or faster pulses. For the Lab, I used two potentiometers to control the brightness and blinking rate of the three LEDs. 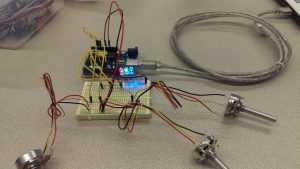 For this portion of the Lab, I used the rotation of one potentiometer to control the brightness of the three LED’s. The other potentiometer controls the gaps and duration between the blinking of the individual LEDs. For the normal lab requirement, I had one rotating control for brightness and one rotating control for blinking rate. 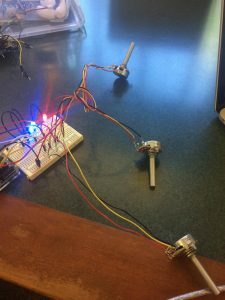 I mapped these controls using soldered potentiometers. For extra credit, I wanted to improve upon my previous piano/forte Lab 2. I mapped one pot to a variable called dynamic, which when rotated would switch from ‘p’ mode to ‘mp mode’ to ‘f’ mode. The other pot mapped to the blinking rate. This is what happens when dynamic is set to the highest and wait is set to almost the lowest. The color crescendo is really fast. 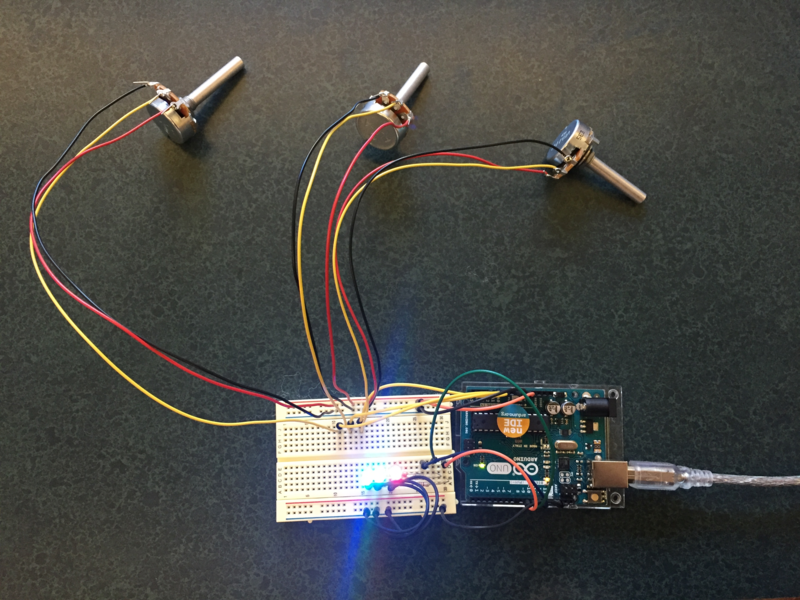 I used 3 potentiometers to light three LED lights. 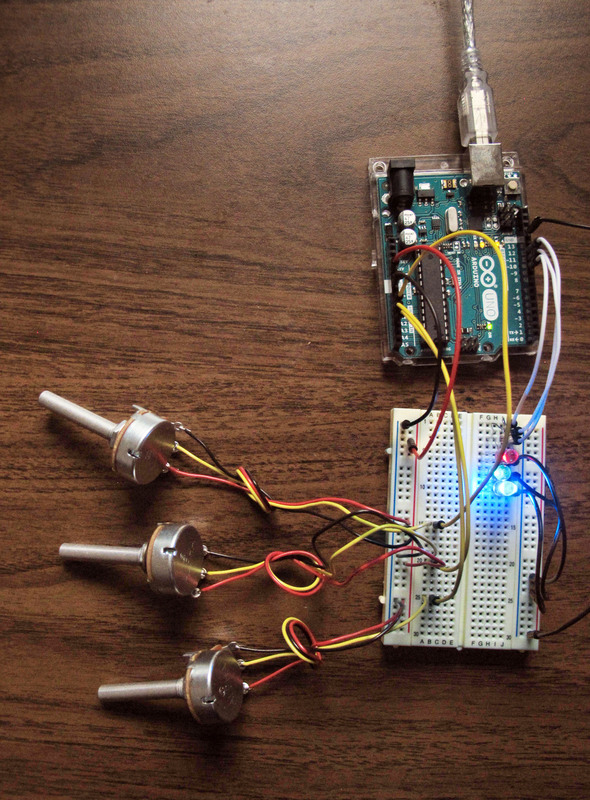 Each potentiometer controls the brightness of one LED light.